I love that January is a completely fresh start. The slate is wiped clean and the possibilities and goals are endless. Something about the New Year inspires us to give things a try and go after some goals that we may not ever try during the rest of the year. Nobody really ever starts anything new in the summer! It also seems as if I get an itch to redecorate some spaces in my home in January. As soon as I start putting away my Christmas décor, I automatically start Spring cleaning. I start making piles for donations and get rid of major clutter. I also start working on the spaces that have piled up with stuff over the past year. So, this January, I've teamed up with some other awesome bloggers for the New Year, New Room Refresh challenge hosted by CasaWatkinsLiving.com! We're bringing you décor inspiration and our room refresh updates every Monday in January so follow along! This year I decided to refresh my master bedroom. It completely falls victim to me throwing stuff in there to get it out of the way. Worn out comfy comforter, mismatched pillows and bedside clutter. I do love my comfy bed but it's time for something NEW! I want something a little glam and out of my comfort zone. Pretty neutral with a POP of color. I have no idea why but all of a sudden I am loving chrome and navy! So my room with be all about gray, silver, navy and some gold. There is even little hints of lilac too. In March I'll be turning 3-0 so it's time that I upgrade my bedroom to feel more grown up if I can and make it feel pretty. Next week, I'll be sharing some progress because I've been working hard to find the right things to fit my needs and space. Most the time needs come first, so you'll have to see what I'm putting together! See you next week. Now you can head on over to all of these lovely ladies and see what they are up to! *totally not creepy heavy breathing* I. Love. It. It looks so chic and modern and cool. So cool. Way too cool vibes for someone like me. That's why I admire you. You're just so cool and the spaces you create are cool, too. Love the neutral palette with some pops! It's totally glam and girlie. I'm really into navy right now, too! I adore all the gorgeous textures you have going on and I totally agree that freshening up the master bedroom especially the bedding, etc. is such a nice treat! I can't wait to see how you pull this together!! Big fan of those neutrals and the blue! You definitely know how to put the "romance" into a space. I love the neutrals and mirrored furniture mixed with brick. I am totally getting the vibe of a romantic loft apartment/bedroom. What a chic and sophisticated color palette for your "grown up" room! I just love the decluttering and organzing inspiration the New Year brings. Can't wait to see your progress this week. I'm sure this will turn out lovely. The colors and finishes are so sophisticated and I know you'll get the look you're after! I love the design you have put together! It is so clean but also inviting! I can't wait to see how it all comes together! 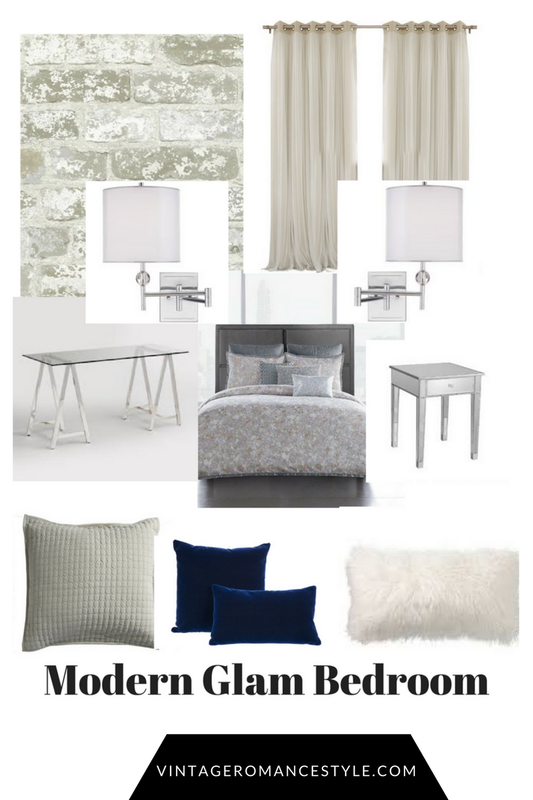 I also love the navy and chrome color scheme, and I think it's so cozy and chic for a master bedroom. Can't wait to see how this space looks when you're done.